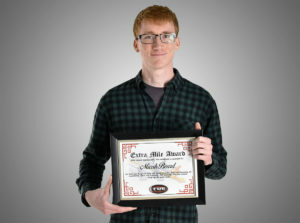 Congratulations to Micah Beard our latest ‘Extra Mile Award’ Winner! 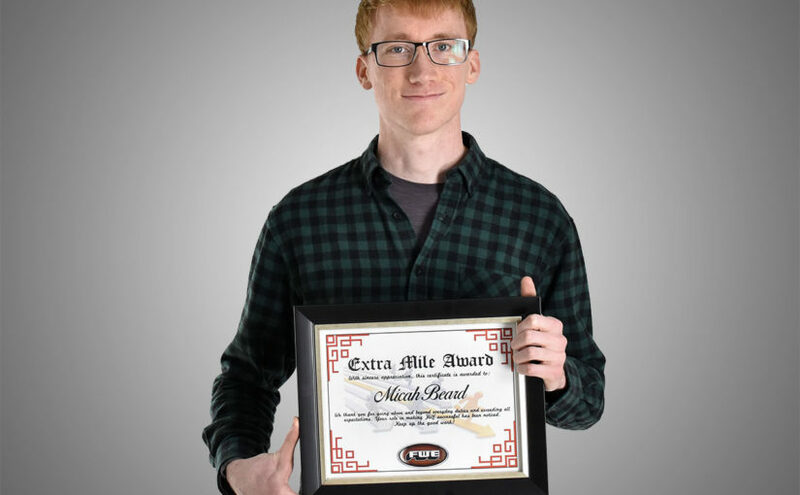 Please join us in congratulating Micah Beard, our next winner of the Extra Mile Award! It is not the length of an employee’s tenure that speaks to their quality of work. It is the effort put into the work. Since joining FWE in May of 2017, Micah has put in 200% into everything he has done for us. He has adapted quickly to policy, procedure and tasks given. He continues to think outside of the box to make procedures better for every task we present to him, without asking. Micah’s commitment to his work has persevered through many long days and sometimes, long nights. A complete overhaul of our company history wall shows us all on a daily basis how planning, research and passion can build a beautiful story. We thank Micah for his dedication to telling our story the right way. As FWE’s Graphic Designer, Micah has elevated the artwork and photography of the company to the next level. He is always ready, willing, and able to provide design insight that keeps FWE in front of the curve and competition. Keep up the good work, Micah!